A report from the semi-official Fars News Agency in Iran is sure to send the Bomb Iran crowd into a frenzy. But it shouldn't. "Parliamentary sources revealed on Saturday that Iran's legislature is due to discuss the country's withdrawal from the Non-Proliferation Treaty (NPT) after the International Atomic Energy Agency (IAEA) director-general released a biased report against Iran," Fars reported. The Vice-Chairman of the Iranian Parliament's National Security and Foreign Policy Commission Mohammad Kowsari said a commission would consider withdrawing from the NPT in response to "a relevant demand by a major political faction of the Iranian university students." This news will surely be seized on by some in the foreign policy community as evidence that Iran is pursuing nuclear weapons capability. However, this is not the first time that conservative Iranian officials, as a result of politicized IAEA reports, sanctions, and continued military threats from Israel and the United States, have spoken of withdrawing from the treaty and ceasing its cooperation with the IAEA. As far back as 1994, in fact, Iranian officials have suggested withdrawing from the NPT in response to international obstruction and denial of cooperation over its nuclear program led by the United States. On July 24, 2003, Ali Larijani, who was then head of the state media outlet Islamic Republic of Iran Broadcasting (IRIB) and member Iran's Supreme National Security Council, told a university audience, "Because we have obtained the essential (nuclear) technology, if they attack our facilities, we will withdraw from the NPT." Larijani is currently the Speaker of the Iranian Parliament, the Majlis. In late September 2004, Larijani was again quoted as saying, "If the Europeans and the United States exert excessive pressure on us, we will have no other choice" but to pull out of the NPT. At the same time, the Islamic Republic News Agency (IRNA) reported that "[l]eading conservative parliamentarian Hassan Kamran has prepared a bill for submission to parliament that would force the government to set a November deadline for the U.N. nuclear watchdog to take Iran off the agency's agenda," and quoted Kamran, who is a member of the parliament's Foreign Affairs and National Security commission, as saying, "The bill obliges the government to pull out of the NPT if the International Atomic Energy Agency does not meet the deadline." In response, Iranian Foreign Minister Kamal Kharazzi told CNN that Iran had no intention of leaving the Treaty. "No that is not our policy," he said. "We are sticking to NPT". Similarly, reformist politicians in the Majlis openly opposed the proposal. In May 2005, senior Iranian officials, including Kharazzi and Mohammad Javad Zarif, Iran's Ambassador to the United Nations, affirmed Iran's commitment to the treaty. In concluding his address at the 2005 NPT Review Conference, Zarif emphasized "that the NPT must be preserved and strengthened. Its longevity must be guaranteed. No consideration is worth undermining the Treaty. Iran is committed to the NPT and the non-proliferation regime and will spare no effort in this regard." At an emergency meeting of the International Atomic Energy Agency (IAEA) Board of Governors, Iranian nuclear negotiator Sirus Naseri addressed claims that Iran was "threatening to leave the NPT or agency safeguards," by declaring, "Never. We have repeatedly stated our firm commitment remain a member of the NPT and of agency safeguards in good standing." On October 31, 2005, speaking before the UN General Assembly, Iranian Foreign Ministry official Hamid Baeidi-Nejad ensured that "Iran is determined to exercise its inalienable right under the NPT to use nuclear energy for peaceful purposes within the framework of the country's overall economic plan," adding, "To that end, Iran is also committed to operating its programme under the IAEA verification system and with increased transparency, in conformity with its basic NPT obligations." The following day, however, he said that "membership at the NPT and the IAEA safeguard agreements not only facilitates nuclear cooperation among member states but is also an obstacle in the way of developing nuclear energy for peaceful purposes." Pointing to the double standard of Western countries with regard to nuclear energy issues, Baeidi-Nejad noted that "countries which are not members of the NPT enjoy better nuclear cooperation." Then, on April 24, 2006, The Jerusalem Post reported Iranian President Mahmoud Ahmadinejad as saying, in response to the possibility of UN Security Council action against Iran, "Working in the framework of the Nuclear Nonproliferation Treaty and the agency is our concrete policy, [but] if we see that they are violating our rights, or they don't want to accept (our rights), well, we will reconsider." Two weeks later, in May 7, 2006, a letter signed by at least 160 Iranian MPs was sent to the United Nations warning that, if issues related to Iran's nuclear and uranium enrichment programs were not settled in a peaceful manner, "there will be no choice for the Majlis but to demand the government withdraw the ratification of the additional protocol and put on its agenda a review of Article 10 of the NPT." Article 10 of the Nuclear Non-Proliferation Treaty maintains that, in the interest of "national sovereignty," member states "have the right to withdraw from the Treaty if it decides that extraordinary events, related to the subject matter of this Treaty, have jeopardized the supreme interests of its country." Iranian Foreign Ministry spokesman Hamid Reza Asefi told the press, "We will not accept any resolution that is against our rights. Any action by the Security Council will have a negative influence on our cooperation with the agency. The involvement of the Security Council will direct the path of cooperation towards confrontation. It's obvious that the Security Council should not take any action that it is not capable of dealing with later because we will not refrain from our rights." Asefi also stated, "Suspension and pause is not on the agenda at all, and the Security Council should not do something that will get it into trouble later on," and "intervention by the Security Council in this issue is completely illegal." Ahmadinejad reiterated, "If the signature of an international treaty threatens the rights of a nation, it will be of no value for that nation." A Tehran correspondent for the BBC deemed that leaving the NPT "is the ultimate threat of non-cooperation by Iran." A few months later, the Security Council adopted Resolution 1696 which illegally called upon Iran to halt its uranium enrichment program. Four months after that, the Security Council passed its first round of sanctions against Iran, banning "the supply, sale or transfer, for the use by or benefit of Iran, of [nuclear-]related equipment and technology" and froze "the funds, other financial assets and economic resources" of key individuals and companies related to the enrichment program. 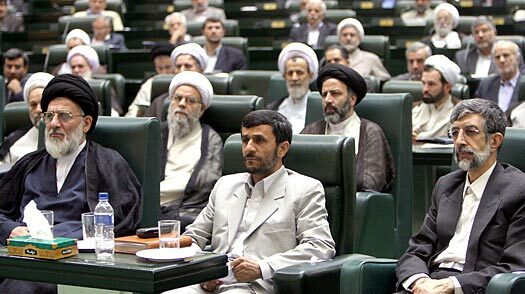 "Following the United Nations Security Council Resolution 1737 against Iran's nuclear activities, the Islamic Consultative Assembly discussed many possible options to show a proper reaction to the resolution, including a withdrawal from the NPT," said Kazem Jalali, Rapporteur of the Majlis' National Security and Foreign Policy Commission in early 2007. According to Fars News, Jalali added, "But a majority of the MPs supported a proposal on revising the country's attitude towards the International Atomic Energy Agency and accelerating the nuclear activities," continuing "Now that it is time for us to make use of our NPT rights, withdrawal from the treaty does not at all serve Iran's interests. Rather, we would like to view it as an option." On September 29, 2009, Reuters reported that, in advance of renewed negotiations between Iran and the P5+1 in Geneva, "conservative hard-liner" Mohammad Karamirad, another member of the Foreign Affairs and National Security commission, declared, "If the Zionists and America continue their pressure on Iran and if the talks...do not reach a conclusion, then parliament will take a clear and transparent position, such as Iran's withdrawal from the NPT." Nevertheless, Ali Akbar Salehi, head of Iran's atomic energy organization, told reporters, "We are acting in the framework of the NPT. We are committed to our commitments." Two months later, in late November 2009, after the IAEA passed a resolution censuring Iran, Karamirad repeated his warning: "The parliament, in its first reaction to this illegal and politically motivated resolution, can consider the issue of withdrawing from the NPT." On June 17, 2010, despite another round of UN sanctions, Majlis Speaker Ali Larijani stated, "The western countries' reactions should not make us angry and cause our withdrawal from the Nuclear Non-Proliferation Treaty (NPT)," adding that, at this time, "I think we should not withdraw from the IAEA or the NPT. We must provide the grounds for implementing the rules by strengthening them instead." And now, another year, another IAEA report, more Israeli threats and American concern, a repeated Iranian call to withdraw from the NPT and frenzied hand-wringing and finger-wagging from the media. November 13, 2011 - A report from PressTV quotes another Majlis minister, a member of the parliament's presiding board, Mohammad-Hossein Farhangi as saying, "withdrawing from the Non-Proliferation Treaty seems to be more advantageous than remaining an NPT signatory and an International Atomic Energy Agency member," according to the official Majlis news agency, ICANA. January 29, 2012 - In anticipation of a visit to Iran by high-level IAEA officials and inspectors, including IAEA Deputy Director General and head of its Department of Safeguards Herman Nackaerts, Majlis Speaker Ali Larijani has once again chimed in on Iran's relationship with the agency. According to Reuters, Larijani "warned the IAEA team to carry out a 'logical, professional and technical' job or suffer the consequences." "This visit is a test for the IAEA. The route for further cooperation will be open if the team carries out its duties professionally," Larijani said. "Otherwise, if the IAEA turns into a tool (for major powers to pressure Iran), then Iran will have no choice but to consider a new framework in its ties with the agency." Meanwhile, Iranian Foreign Minister Ali Akbar Salehi was quoted by the Mehr News Agency as saying, "We are very optimistic about the outcome of the IAEA delegation's visit to Iran...The nuclear issue has taken the right course and our interaction with the agency has been good, and the cooperation has been close and extensive." Salehi, who was speaking to reporters during a trip to Addis Ababa, also remarked, “We have always tried to adopt transparency as one of our principles of cooperation with the agency, and during their visit, the agency's delegation will have some questions that will be answered appropriately." "We have nothing to hide and Iran has no clandestine activities," he added. September 16, 2012 - Majlis speaker Ali Larijani is once again floating the idea of Iran withdrawing from the NPT due to the heavily-politicized nature of the IAEA and its recent resolution calling for Iran to allow inspectors access to the military site at Parchin, a facility not covered by Iran's safeguards agreement with the agency and therefore outside its purview. Larijani, as he has in the past, said, "The recent resolution by the Board of Governors raises this question for the public: What is the benefit of the NPT and membership in the International Atomic Energy Agency for countries?," adding, "If Iran had not been committed to the NPT, would Western countries have taken other measures?" Considering Larijani has used this line for nearly a decade now, it's repetition clearly expresses his frustration at the politics at play over his country's monitored nuclear energy program and the constant threats made against Iran rather than any real ultimatum about Iran's treaty obligations. Speaking directly to such threats, as well as echoing Larijani's statement, Revolutionary Guard commander General Mohammad Ali Jafari told reporters today that, if attacked, Iran will no longer be committed to the NPT, explaining however that this does not mean Iran would actually build a nuclear weapon. "If the world and international organizations fail to prevent such an attack, it's natural that Iran's commitments [under the NPT] would naturally change and the situation would be different from the past. These are the risks and consequences that such an attack will bring about, and these matters would be a deterrent," he said. October 23, 2012 - Speaking in Quebec yesterday, an Iranian Majlis member who sits on the parliament's National Security and Foreign Policy Committee, Kazem Jalali, again affirmed Iran's commitment to its obligations under the NPT. "Regarding the issue of nuclear energy, Iran has constantly emphasized two points at the same time," Jalali said. "One is that as an NPT signatory, Iran complies with all international laws, and the other is that Iran will not back down on its right under the NPT to achieve peaceful nuclear energy." November 30, 2012 - Reuters reports today that a high-level Iranian official has once again floated the idea of his country potentially pulling out of the Nuclear Non-Proliferation Treaty. In an 11-page written statement submitted to the IAEA's 35-nation Board of Governors, Ali Asghar Soltanieh, Iran's ambassador to the agency, suggested that, in the event that Iran was attacked militarily, "there is a possibility that the parliament forces the government to stop the agency inspections or even in the worse scenario withdraw from the NPT." Such a move would also enable Iran to "kick out IAEA inspectors and install its uranium enrichment centrifuges in 'more secure' places," Reuters' Frederik Dahl reported. Soltanieh said "the only way that encourages Iran to show more flexibility in taking voluntary steps" to curb elements of its legal nuclear program would be for the Iranian nuclear file, illegally referred to the UN Security Council by the IAEA in 2006, "to be closed immediately" and for IAEA inspections to follow the "routine" as laid out by its Safeguards Agreement, rather than the extralegal demands that exceed the agency's mandate. Soltanieh reiterated the decades-old official Iranian position that "nuclear weapons have no use and [their possession] only creates vulnerability," adding that "any military action against Iran would not stop it from enriching uranium." While this news will certainly induce the requisite hysterical finger-pointing and 'I-told-you-so'-ing among the usual Iran Nuclear Scare™ crowd, it is vital to remember the circumstances under which Soltanieh is noting this possibility of NPT withdrawal: that is, after an illegal, unprovoked, military assault on a sovereign nation; a country whose nuclear facilities are constantly monitored, regularly inspected; whose enrichment activities are wholly legal; and whose program all Western, Russian and Israeli intelligence agencies agree has no military component. Soltanieh also made clear that any military attack on nuclear facilities would not have the desired effect of destroying Iran's entire nuclear program. "Iran is master of enrichment technology...it can easily replace damaged facilities," he said, adding that diplomacy is the only way forward and that Iran is "well prepared to find a negotiated face-saving solution and a breakthrough from the existing stalemate." December 1, 2012 - Unsurprisingly, Majlis speaker Ali Larijani, in the wake of Soltanieh's statement, had some additional words for the IAEA. "The International Atomic Energy Agency has adopted a political approach to Iran’s nuclear program," the lawmaker said, adding that both the IAEA and the P5+1 nations should abandon their fruitless "double-standard policies" if any progress toward a negotiated resolution to the current standoff over Iran's nuclear program is to be made. January 10, 2013 - An interview with Iranian Foreign Minister Ali Akbar Salehi, who holds a degree in nuclear physics from MIT and was formerly Iran's ambassador to the IAEA and head of Iran's Atomic Energy Organization, which was conducted in the Fall of 2012, was recently published in World Policy Journal. To be very honest and open with you, Iran has already acquired nuclear technology in all its domains, from mining, conversion, turning it into fuel rods, nowadays fuel plates, designing reactors, research reactors, building, manufacturing centrifuges, enriching uranium, producing heavy water, and constructing our own heavy water reactor indigenously. So there’s nothing in the nuclear field that we have not really achieved, and the technology is within our reach. Those who think that we may be using this technology for other purposes, this is their own, I would say, ill-thinking. What can we do? We have already stated over and over that we have not intended to do anything else. If we wanted to take that approach, we would have detached ourselves from the NPT [Non-Proliferation Treaty]. There is in the treaty an article which says whoever is in the NPT, if they wish, they can get out of it with three months notice, and then free of the NPT, we could do whatever we wanted to do. April 8, 2013 - Alaeddin Boroujerdi, an Iranian parliamentarian who heads the Majlis Security and Foreign Policy committee, said today, "It's not acceptable that Iran respects NPT but the U.S. and the West ignore NPT's Article 6 — reducing nuclear weapons — and Article 4 — right to enrichment. Therefore, there is no reason for Iran to remain an NPT member under such circumstances." "All options are on the parliament's table," he added. Such a statement, as we have seen, is nothing new from Iranian lawmakers, often occurring after frustrating and fruitless negotiations or in anticipation of illegal sanctions imposed on Iran over its nuclear program. A week ago, Iranian Foreign Ministry spokesman Ramin Mehmanparast told reporters in Minsk, "Iran is after restoring its rights stated in the Non-Proliferation Treaty and believes that the framework of talks should be formed on these bases," demonstrating Iran's continued appeal to its - and the NPT's other signatories - treaty obligations and inalienable rights. Associated Press correspondant Ali Akbar Dareini reported, "Boroujerdi said Iran cannot remain an NPT member while it is punished for exercising its nuclear rights, while offering terms for a deal at the same time — halting high-quality enrichment in exchange for cancellation of punishing Western sanctions." "They say stop 20 percent enrichment. This is while such level of enrichment and even 20 and 50 percent is authorized on the basis of IAEA rules. The red line is nuclear bomb," Al-Alam, Iranian state television's website, quoted the parliament minister as saying. "If we are to cooperate in areas such as 20 percent enrichment, sanctions against Iran must definitely be lifted in return," he continued. Boroujerdi also rejected the shuttering of Iran's Fordo enrichment facility, which is underground and heavily fortified. "Fordo is to protect our nuclear equipment from the danger of air attacks or missile strikes by the Zionist regime," he said. "No sane person would put its wealth at the disposal of the enemy's target." April 22, 2013 - Like clockwork, despite certain comments made by Iranian parliamentarians that gain undue attention in the Western media, the Iranian Foreign Ministry has again affirmed its continued commitment to the Nuclear Non-Proliferation Treaty and it safeguard agreement with the IAEA. In response to a recent statement by the five permanent, nuclear-armed members of the United Nations Security Council which claimed the Iranian nuclear program constituted a "serious challenge" to the treaty and called for the establishment of a Nuclear Weapons Free Zone in the Middle East, on Saturday April 20, 2013, Iranian Foreign Ministry spokesman Ramin Mehmanparast reiterated Iran's role as a "committed member" of NPT. He said, "Iran has continued its completely peaceful nuclear program under the permanent monitoring of the IAEA inspectors," adding, "We are a committed member of the agency. We were one of the countries which signed the NPT first. We comply with our commitments under the treaty." "The Iranian foreign ministry official also noted that the country will continue its cooperation with the International Atomic Energy Agency (IAEA)," reported the Iranian Students' News Agency (ISNA). Additionally, on Monday April 22, 2013, Iran and the 119 other members of the Non-Aligned Movement (NAM) urged the total elimination of nuclear weapons, under the auspices of the NPT and its attendent obligations. In a statement delivered by Mohammad-Reza Sajjadi, Iran's UN envoy to Geneva, NAM - which is currently chaired by Iran - "described Israel and its nuclear program as the main threat to regional peace and security and condemned Tel Aviv's move to develop its arsenals. It also urged a ban on nuclear cooperation with the regime," according to Iran's PressTV. "The statement said that possession, use or threat to use nuclear weapons all violated the UN Charter and international law, adding total elimination of nukes was the only guarantee against the use or threat to use such arms," and also stressed NAM's support for "talks on the conclusion of a global, binding, unconditional, unbiased and irrevocable convention that would compel nuclear-armed countries to give assurances to non-nuclear states that they would not use or threat to use such weapons against them." In a clear rebuke to the attempts to abrogate the inalienable national right to a civilian nuclear energy program, the statement also "backed the development of peaceful nuclear activities and the countries' right to use civilian nuclear technology." June 18, 2013 - Iranian Foreign Ministry spokesman Seyyed Abbas Araqchi reaffirmed Iran's continued commitment to the NPT and to its safeguards agreement with the IAEA. Speaking with reporters on Tuesday June 18, Araqchi said, "Iran adheres to its commitments within framework of the Non-Proliferation Treaty and the Safeguards Agreement, and will continue its cooperation with the Agency." Addressing, demands made of Iran that exceed the IAEA's legal mandate, he added, "If the International Atomic Energy Agency's expectations are beyond Iran's obligations [under the NPT], this will require the definition of a new framework which we are currently negotiating." July 25, 2013 - With a new administration in office in Iran, the nation's commitment to its international treaty obligations have not changed. Addressing the United Nations Security Council in New York City on July 23, Iran's Deputy Permanent Representative to the world body, Gholam Hossein Dehqani, declared, "The nature of Iran's nuclear program is completely peaceful and is fully compatible with the country's international undertakings." "In addition to its membership in the NPT, the Islamic Republic of Iran is a member of all (the relevant) international treaty arrangements and is committed to all the undertakings resulting from the (NPT) rules," he added. September 6, 2013 - Ali Akbar Salehi, head of Iran's Atomic Energy Organization, has said that Iran is ready to allay international concerns over Iran's nuclear program "using every treaty, regulation and mechanism at the international level."